Click here or the image below to download PDF file. Shaykh al-Islām Muḥammad bin ʿAbd al-Wahhāb was a peaceful preacher to whom enmity, hatred and violent aggression was shown because he educated the common people what is suggested by fiṭrah, reason and revelation, to abandon invoking saints and instead to invoke Allāh alone. The spread of his message conflicted with the interests of authority figures in politics and religion. Centuries of bigotry, partisanship, intellectual decline and blind-following coupled with enmity were mobilised against his call and, in his own words, he only resorted to fighting in order to protect himself from unlawful, unjustified, oppressive violence. His enemies from the partisan religious authorities fabricated lies against him in order scare the common folk from him and to instigate and mobilise political authorities against him. From the slanders and fabrications made against him was that he makes generalised takfīr of the ignorant masses and demands that his opponents emigrate to him in order to validate their faith and other such lies, leading to the accusation of Khārijism. 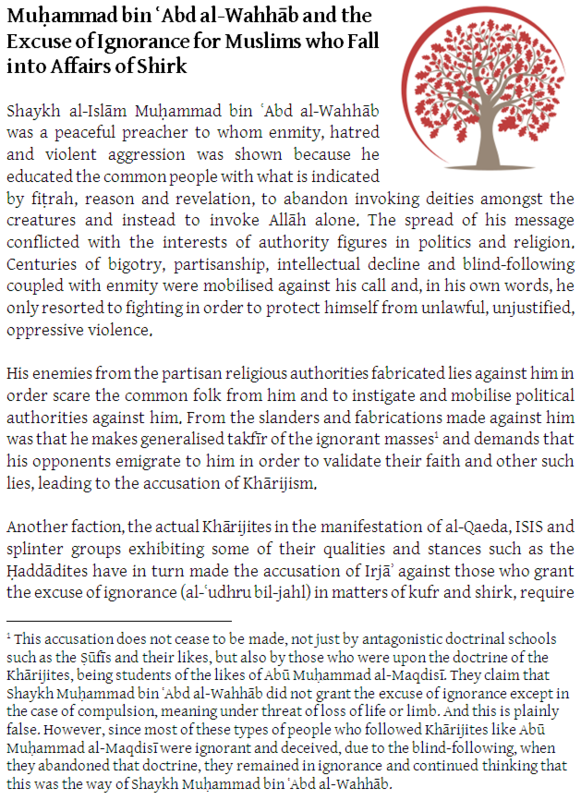 Another faction, the actual Khārijites in the manifestation of al-Qaeda, ISIS and splinter groups exhibiting some of their qualities and stances such as the Ḥaddādites have in turn made the accusation of Irjāʾ against those who grant the excuse of ignorance (al-ʿudhru bil-jahl) in matters of kufr and Shirk, require establishment of the proof (iqāmat al-ḥujjah) for takfīr of specific individuals.